GRAIN | No, giant farms are not feeding the world. They’re feeding Canada. No, giant farms are not feeding the world. They’re feeding Canada. If you've followed debates around US agriculture over the past decade, you've surely heard it: Our industrial-scale farms may pollute and overuse water, foul air, destroy soil, harm local economies, and abuse workers, but that's just the cost of providing a crucial humanitarian service: feeding the world. The GMO seed/pesticide giants Monsanto and DuPont make versions of this argument; so has USDA secretary Tom Vilsack, the California Farm Bureau and American Soybean Association. But can US exports really help "feed the hungry and malnourished in developing nations around the world," as the industry-funded site Facts About GMOs puts it? So, most of the countries that buy lots of US-grown food—and especially the ones at the top of the list—are highly developed (based on UN measures of life expectancy, income and level of education) and have low hunger rates. 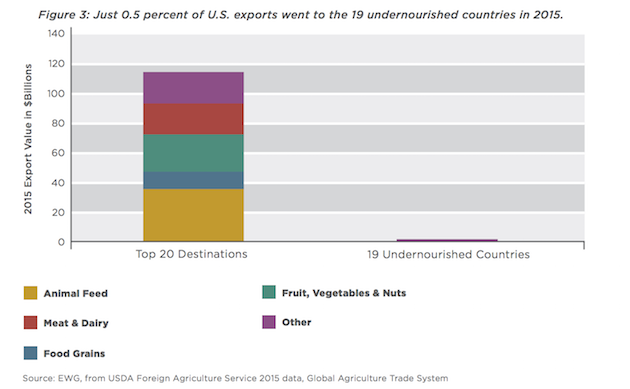 Meanwhile, the 19 nations with the biggest and most dire hunger problems import very little food from the United States—they accounted for a whopping 0.5 percent of total US agricultural exports in 2015, EWG reports. Even accounting for food aid, the great US ag behemoth contributes very little to feeding the poorest of the world's nations. This chart depicts how much the world's most hunger-plagued countries rely on US food exports as a percentage of their total food supply. Takeaway: not very much. So why are our food exports largely bypassing the world's poor? The answer lies in the first chart above. Note that about half of our exports to the top 20 destinations are either meat and dairy or livestock feed, and meat is a luxury product. As EWG puts it, "most agricultural exports from the United States go to countries whose citizens can afford to pay for them." There's a lot to be done to alleviate hunger as global population grows and climate change continues to wreak havoc on agriculture. But growing loads of soybeans in Iowa or almonds in California is largely irrelevant to those challenges. The EWG report can be downloaded here, and an infographic explaining the data, here.